The soda industry has not had a good year. A soda tax was implemented in Berkeley. Mexico’s soda tax is reducing consumption. Coca-Cola got caught funding scientists who shift blame for obesity away from bad diets. 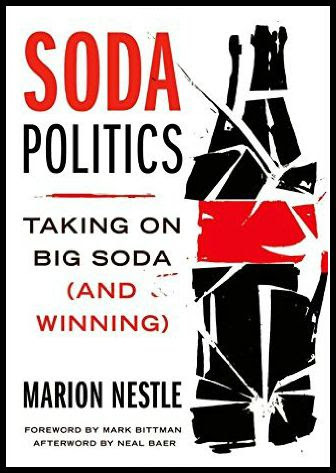 Marion Nestle’s new book, Soda Politics: Taking on Big Soda (And Winning), takes us on a fascinating, detailed and disturbing journey, tracing the rise of the world’s soft drink behemoths, and the damage they have inflicted on the world’s health and environment. Dr. Nestle, a prolific writer on the politics of food and drink and a professor of nutrition at New York University, has done exhaustive research. The book covers an incredible range of topics including the soda industry’s relentless marketing tactics, its targeting of minorities and low income consumers, its lobbying and political clout, and, its use of philanthropy to silence potential critics. I corresponded with Nestle to learn more about how Big Soda has become one of the most powerful and profitable industries in the world and how health advocates can fight back. How did something as simple as sugar water become a multi-billion dollar, multinational business? Through brilliant marketing in a word. Coca-Cola started advertising early on–we are talking more than 100 years ago–and also producing vast numbers of logo-laden tchotchkes that today are invaluable collectibles. During the Second World War, the company made a deal with the military to provide Coke to every GI everywhere in the world, with the military helping with transportation, storage, and building bottling plants. Last year, Coke spent $269 million just to advertise classic Coca-Cola. What are the other ways the soda industry moves and protects its market? The object of the game is to get your logo everywhere. I was in a remote area of Northern India where there were no restaurants or grocery stores, but there were plenty of kiosks selling PepsiCo products–a fabulous distribution system. The companies attract children with toys, of course, but also with prominent sports and music figures and sponsorship of sports and music events. Coca-Cola’s philanthropic efforts are breathtaking. It funds an extraordinary number of groups engaged in social, health, and activity actions. Recipients of such grants are unlikely to use them to fund “drink-less-soda” campaigns. And then there’s all the behind-the-scenes lobbying. As you outlined in the book, Big Soda is adept at targeted marketing. Which market segments are the most important to the soda industry and why? Coca-Cola is an equal opportunity marketer, but the segments that drink the most soda are those of lower income, less education, minority status, and male. That’s where the marketing dollars go. Poor people may not have much income, but sodas are affordable, and they drink the most of it along with suffering the consequences–poor diets, obesity, type-2 diabetes and related health problems. Why does the soda industry continue to market to children when that has become such a contentious issue? Its officials say they don’t. Coca-Cola withdrew its commercials on children’s TV programs 50 years ago and both it and Pepsi have pledged not to market directly to kids under the age of 12. “Directly” hides the loopholes. Any time a soda or any other food company is involved in a kids athletic program, for example, it’s marketing to kids–just not directly. Similarly, a vending machine with a Coca-Cola logo in a school is marketing to kids even if the products in the machine don’t have much sugar. Knowing the soda industry spends billions on advertising each year, what would you say to people who think that they are making soda choices of their own free will? The whole point of successful advertising is that you don’t notice it or don’t view it as trying to sell you something. I recently went to World of Coca-Cola in Atlanta. You pay $16 to get into it for the privilege of experiencing Coca-Cola marketing on steroids. It begins with a video of great moments in people’s lives that is so touching that there isn’t a dry eye in the house, mine included. It’s about love, success, happiness, and family, and only peripherally about Coca-Cola. Then you get to view the history of the company’s advertising, view ads, taste products from around the world, and exit through an enormous gift shop. Wow. So people who claim they are immune to soda advertising are fooling themselves? It’s more complicated than that. The advertising and its influence are unconscious and unrecognized. The emotional impact gets filed in your brain in a different place than the results of critical thinking. That’s why the marketing is so insidious. It’s impossible to see it for what it is unless you do a conscious override and pay close attention. Even then, the commercials still make you teary. Marketers take advantage of these human characteristics. You started to mention Coke’s philanthropic activities. It recently began listing, online, the organizations it has funded since 2010. Is any of this giving truly charitable or does it all have an ulterior motive? It’s both. I emerged from my immersion in Coca-Cola marketing thinking that the company is schizophrenic. I describe this as softball vs. hardball in my book, but after Coca-Cola World I think of it as Dr. Jekyll and Mr. Hyde. Dr. Jekyll is all about helping communities and building a better world. Mr. Hyde is all about making sure that potential critics are bought off and remain silent. Ultimately, both are about selling a product that when consumed in excess is not good for health. In your book, you discussed numerous interventions to lower soda consumption such as warning labels, taxes and procurement policies. Is there a particular policy, intervention or mix of mechanisms that you think will be the key to lowering consumption? The literature on social change is pretty clear. You need a mix of education and policy. What these policy initiatives do–even if they fail at the ballot box or in court–is educate the public about the harmful effects of sugar-sweetened beverages in anything more than small amounts. Soda sales are way down in the United States–hence the subtitle “Taking on Big Soda (and Winning).” The soda industry blames that on health advocacy so effective that the secular trend is to drink far fewer sugary beverages. I’m for the mix of all the policies you mention plus plenty of media attention to cutting down on sugar in all its forms. With sales dropping, soda companies have been searching for their holy grail–a great tasting, zero calorie, 100% natural sweetener–which they think will revitalize soda sales. Are they on the right track? The Dr. Jekyll’s tell me that they are sincerely interested in public health, are promoting smaller portions, and looking for acceptable low-calorie sweeteners. They think they can make money by selling these at a premium price. That strategy is working for the little cans. They are selling like hotcakes at prices similar to those for larger portions. The real question for me is whether we can get the Mr. Hyde’s to stop fighting public health initiatives. If industry does find its holy grail, Big Soda will surely market that product fiercely. Would you be comfortable with consumers drinking an artificially (but naturally) sweetened product in the same quantities that it has been drinking sugary soda? It depends on what it is. I’d want to know whether drinking such drinks helps people maintain healthy weights. I don’t recommend diet sodas because I don’t like the way the artificial sweeteners taste, and because remarkably little evidence finds that they help people lose weight. While researching Soda Politics, did you learn anything that truly surprised you? I most certainly did. I was unaware of the complicated history of the soda industry’s relationships with minority groups in the pre-obesity era, when these groups protested their exclusion from advertising and employment. I also knew that soda companies funded community, medical, and research groups but had no idea of the comprehensiveness of such funding. How do you see the battle between public health and the soda industry playing out in the next decade? I think public health is winning. The Dr. Jekyll’s in the soda industry tell me that their future involves healthier drinks in smaller portions. Those are steps in the right direction. The next challenge for advocates is to get the Mr. Hyde’s under control and stop the industry from lobbying against public health measures, funding research designed to undermine the results of independently funded research, funding health professionals so they won’t advise drinking less soda, funding astroturf groups to fight their battles for them, and marketing sugary drinks to vulnerable populations in developing countries. Advocates still have plenty of work to do. I hope my book inspires everyone to get busy.